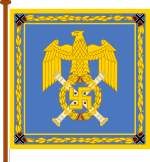 Reichsmarschall, Marshal of the Reich (literal translation: Empire or Realm), was the highest rank in the Wehrmacht of Nazi Germany during World War II. 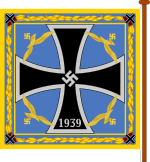 The rank of Reichserzmarschall was originally created before the 12th century, during the time of the Holy Roman Empire. 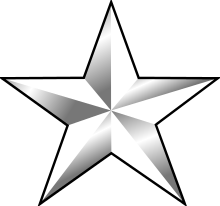 During the era of the German Empire and World War I, no one in the German Army held the rank. During World War II Luftwaffe Commander-in-Chief Hermann Göring was the only man elevated to Reichsmarschall. 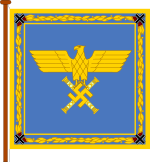 He was promoted by Adolf Hitler during the 1940 Field Marshal Ceremony, which took place on the 19th of July, primarily to denote him as senior to the other commanders of the Wehrmacht's general staff made Generalfeldmarschall that day and establish him as Hitler's successor to leadership of the Reich. Nevertheless, following a late April 1945 telegram from Göring asking Hitler for permission to assume leadership, Hitler relieved Göring of his duties and named a new successor, Grand Admiral Karl Dönitz. The appointment was made on or before the day of Hitler's suicide (30 April 1945), but notification by Martin Bormann and Joseph Goebbels was delayed until 1 May 1945. ↑ Haskew 2011, p. 46. ↑ Haskew 2011, pp. 25, 46, 119. Haskew, Michael (2011). 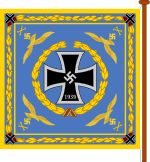 The Wehrmacht. Amber Books. ISBN 978-1-907446-95-5.